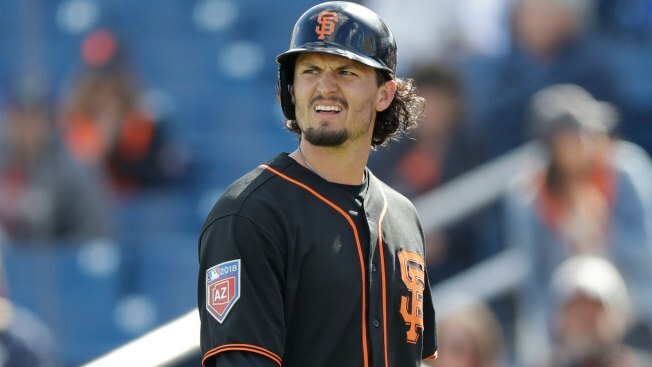 SAN FRANCISCO - A year ago at this time, Jarrett Parker was preparing for his shot to be the Giants left fielder. Now he may be headed elsewhere. Parker was designated for assignment, manager Bruce Bochy announced, to clear a roster spot for Derek Holland. A left-handed starter, Holland made the team with a strong spring and will take Jeff Samardzija's spot in the rotation, starting Saturday against the Dodgers. Holland will follow Ty Blach and Johnny Cueto, with Chris Stratton rounding out the group. Parker, 29, has always shown intriguing power potential, but has never been able to grab a full time job. His best opportunity was shredded last April when he injured his clavicle crashing into a wall at AT&T Park. In 135 games for the Giants, Parker hit .257 with 15 homers in 342 at-bats. He came into this spring out of options and struggled early, falling behind other outfield candidates like Gregor Blanco, Gorkys Hernandez and Steven Duggar. If Parker is not claimed by another team, the Giants will send him to Triple-A Sacramento.